Recent research has revealed that bats that hibernate in dense clusters are being hit harder by white-nose syndrome. Biologists at the University of California, Santa Cruz comparing bat species that hibernate alone to those that hibernate together found that declines were less severe in smaller colonies of solitary bats. In contrast, bat species that hibernate in close proximity saw steep declines even in small colonies. It appears that the dense clusters allow the fungus to transmit at a high rate, allowing for continued decline. 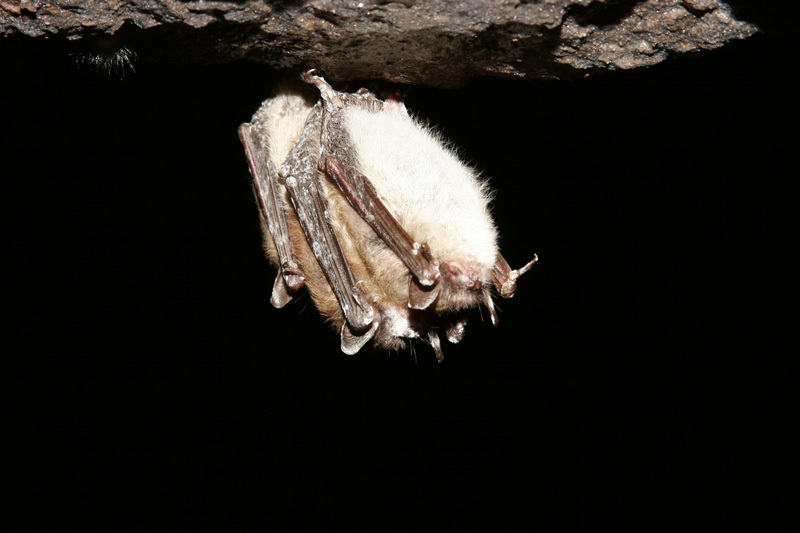 While studying data from bat surveys between 1979 and 2010, researchers discovered that two bat species have become more solitary in the wake of white-nose syndrome. The little brown bat, one of the hardest hit species, is no longer predicted to become extinct after it began changing its social behaviour. Up to 75 percent of the once highly social species which hibernates in dense clusters, are now being found roosting alone. This adaptation will likely result in them surviving at smaller populations. The other species that exhibited a change was the federally endangered Indiana bat. Unfortunately the change has not been as dramatic, with only 8 to 9 percent of them roosting alone. This is not enough to change their fortunes, which will probably mean their continued decline toward extinction. The study, funded by the National Science Foundation, National Institutes of Health Ecology and Evolution of Infectious Diseases Program, Bat Conservation International and the U.S. Fish and Wildlife Service is published in the current issue of the journal Ecology Letters. A biologist on cavechat brought up the issue of cave gating creating abnormally large colonies and that has been proven to have negative effects on bat populations. Since diseases and maladies such as WNS could spread exponentially faster in larger colonies perhaps by continuously gating caves we have opened a pandoras box so to speak. But of course the caving community will stand vehemently defiant in support of their agenda of limiting access to caves through gating to only those that are deemed worthy by the caving elite. Bats be Dam*** these are our caves! I will always wonder if WNS has been the result of well meaning conservationists creating an overpopulation of bats.